Because of my tight schedule I was forced to fly two different airlines on a recent trip to Fes, Morocco. I flew there from Paris on Royal Air Maroc. Nothing fancy; but it was expensive. The Ryanair flight was ridiculously cheaper than its Royal Air Maroc counterpart. I knew there had to be some good reasons for that — none of them pleasant. Ryanair demanded we check in online and have our boarding passes in hand. OK.
Mitch’s carry-on was a little bit bigger than the allowed size. He had to pay to check it. (We could have tried to shift some of his stuff over to my carry-on, but it still might have been too big.) Eighty U.S. dollars — which immediately doubled the price of his ticket. Ka-ching. Reserved seating was more. Otherwise, you were on your own. I was thrilled to get two seats together near the front without having to elbow or fistfight my way through. The airline seats didn’t recline. Oh, well. Safety instructions were pasted onto the seat backs. There was no seat pocket. There was an inflight magazine — just one — and I grabbed it. I had to applaud the ingenuity. 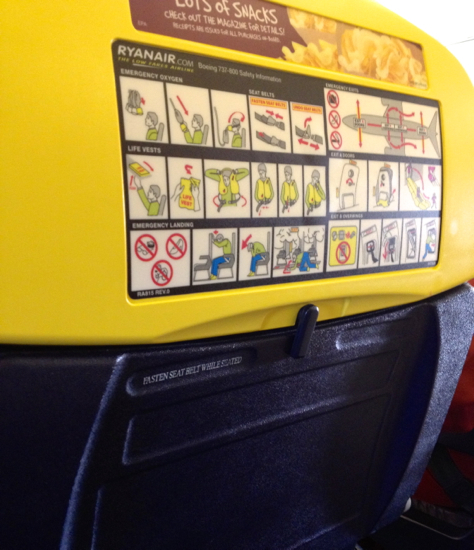 It was the size of a TV Guide, packed with Facebook blurbs from Ryanair travelers about Ryanair destinations. Brilliant! 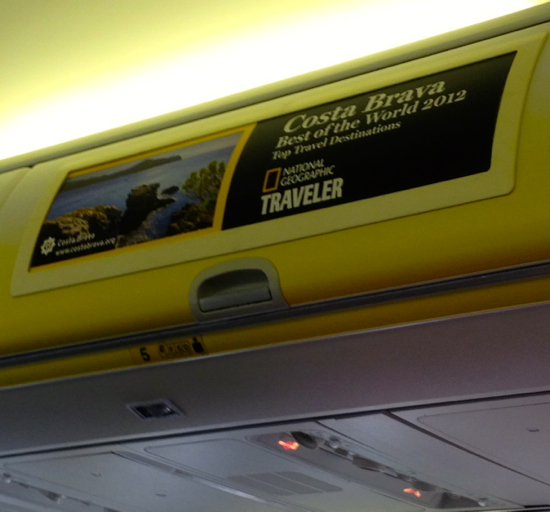 Another cool marketing ploy: Paid ads adorning the overhead compartments. No free grub for the almost-three-hour flight. But there were passable sandwiches — about $4.50 apiece, which is what you’d pay on a U.S. airline. Condiments were also extra, as were all beverages. Ka-ching. Ryanair uses an airport about an hour away from Paris, so we had to pay 40 bucks for two for a bus to the city. Given that Royal Air Maroc also uses an airport outside the city, that wasn’t so awful. Verdict: Worth it, as long as you stick to the carry-on guidelines. This entry was posted in How to travel smart and tagged airline fees, Europe budget airlines, Paris to Fes Morocco, Ryanair, travel. Bookmark the permalink.